The chile con queso at family-business Alicia’s Mexican Grille marries the simple goodness of cheese and fresh pico. Photo by Marie Elgamal. Alicia’s Mexican Grille, multiple locations: Find the savory staple at this family-operated restaurant where the ingredients speak for themselves. Hearty cheese envelopes fresh homemade pico made from cilantro, Roma tomatoes, onions and jalapeños. Add-ons include ground beef for $1.95, Black Angus fajita beef for $2.95 and chicken fajita meat for $2.25. Without toppings, the small is $4.95 for eight ounces, or 62 cents per ounce, and the 12-ounce large is $6.95, or 58 cents per ounce. Need to satisfy a significant need for cheese? Guests can buy 20 ounces for $9.95 (50-cents per ounce), 32 ounces for $15.95 (50 cents per ounce), a half-gallon for $27.95 (44-cents per ounce), and a full gallon for $50 or 39 cents per ounce. 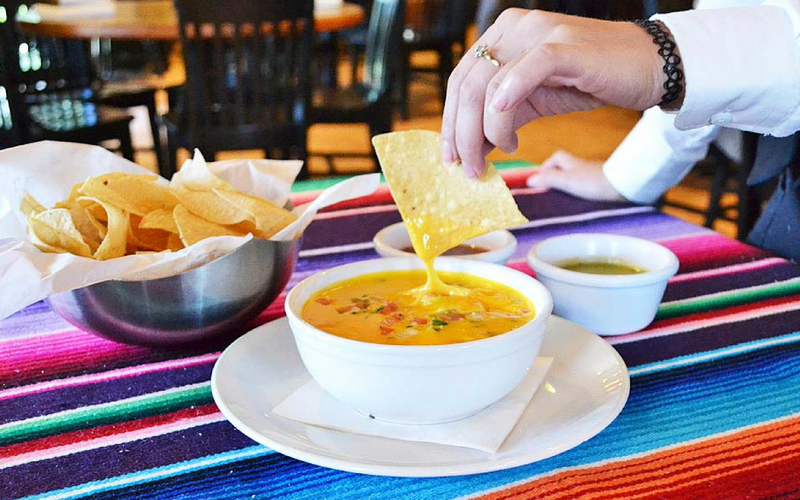 That’s a great queso deal for a crowd.